Microsoft is apparently preparing the ground for another big push to get folks to upgrade to Windows 10, with an intrusive move to try and force the update onto Windows 7 and Windows 8.1 PCs. 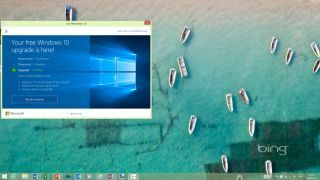 This news comes courtesy of Josh Mayfield, the creator of GWX Control Panel, a piece of software which allows users to block the Windows 10 upgrade from popping up on their PCs. However, Mayfield has had something of an uphill battle in defending users' machines from Microsoft's upgrade, and the weekend before last he found out that the 'AllowOSUpgrade' setting was being reversed for those who had switched it off – and indeed, the switch kept resetting itself apparently multiple times every day for those who kept re-implementing the setting. Why is this happening? Mayfield explained to Computerworld that Microsoft keeps re-serving its GWX (Get Windows 10) applet to PCs running Windows 7 and Windows 8.1 complete with undocumented changes, and evidently this new behaviour is something to do with the latest tweaks. Does all this sound like reasonable behaviour from your operating system? Hardly, and as Mayfield noted, this latest move "does leave your PC vulnerable to unwanted Windows 10 upgrade behaviour". Indeed, the GWX updates are running alongside changes to Windows Update, and thus Mayfield theorises that Microsoft is working up to a new major scheme to push Windows 10 adoption. We've previously observed that Microsoft needs to be careful about its heavy-handed tactics in pushing Windows 10, as all this is likely to lead to resentment and people deciding they most definitely don't want the new OS on their PC (particularly when you also consider the privacy issues which have cropped up with the operating system in recent times). Redmond needs to tread very carefully indeed if it doesn't want adoption to slow further still – the latest figures have already pointed to a slowdown, which is likely part of the reason for stepping up the upgrade campaign. We are now getting daily pop-up messages on our Windows 8.1 PC urging an upgrade, and have been for a couple of weeks.